Not surprisingly the two big drivers of 6 week in-calf-rate, are submission rate and conception rate. The third is survival of the conceptus (often combined within conception rate). Historically, the industry has focused on getting trace element status right by mating. This initially focused on selenium and copper (conception rate) and then iodine (submission rate). 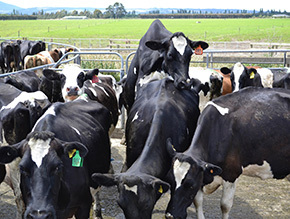 Trace element status is a necessary part of the picture, but there is much more to it – what happened over calving and the role trace elements play then has a profound influence on reproductive measures. When the birth is fast and free of complication, what we achieve metabolically for the cow will also positively influence the health of the reproductive tract. RFM and resultant infection or lack of it is obvious, but what is not so obvious is endometritis which is inflammation of the lining of the uterus (not an infection as such). Endometritis is like “rough not so inviting bed sheets” and we need this to be “ironed out” before mating! So mineral inputs that give rise to fast complication free calving and continue after calving also have a part to play in setting up a healthy fertile uterus. Trace element nutrition after calving has two objectives; firstly to make sure the dietary intake is complete including compensating for the cow’s “not eating enough”, and secondly to strategically focus on reproduction. The healthy functioning of the ovary & uterus, growth of quality eggs and the expression of oestrus are all influenced by elevated levels of specific trace elements in combination. We have been able to readily demonstrate and record these differences. In addition to the health and function of reproductive structures (uterus and ovary), the nourishment and protection of the conceptus is important. The conceptus starts off as one barely visible cell inside a 500 kg cow! It divides rapidly, each division carries risk of becoming defective. Anti-oxidants are particularly relevant – they protect cells from free radical oxidative damage. Anti-oxidants include enzymes containing selenium, zinc, manganese, and the antioxidant vitamin E. Vitamin A and folic acid and also known to be critical to embryo viability. And don’t forget maiden heifers. After liveweight, the key to heifer fertility is to have their trace element and mineral (including calcium and phosphate) nutrition correct before and during puberty, and then maintain their status through to mating. MCM MATING is a trace element formulation designed to continue to build status ahead of mating. It follows on from our MCM CALVING product as the second step of our Peak Performance Programme, generally starting from 6 weeks after the planned start of calving. It is available in soluble powder, feed-out wagon premix, and liquid formats and can be added to pellets/ concentrate mineral pellets. HOLDMATE is a fertility vitamin combination delivering elevated inputs to support reproductive tissues and the developing conceptus. It used from 2-3 weeks prior to mating to 2 weeks after mating and can be delivered via water trough dispenser, feed-out wagon, cone-dose or pellets/ concentrate mineral pellets. Individual trace element solutions; SELENIUM, COPPER, COPPER GLYCINATE, ZINC, ZINC GLYCINATE, COBALT, IODINE. This ranges allows individual deficiencies to be addressed, and can also be used as part of a programme (including strategic top-ups). For those who are set up to administer minerals via the water supply for young stock, CATTELMIN is a convenient way to supplement trace elements in order to set replacements up over the autumn/ winter and continue through the spring. It is designed to be used at variable dose rates and can take into account if catch up is required.